LEN - www.lankaenews.com | Our ‘Simple’ Simon of a president takes jumbo group of family merry makers to New York on his junket ! Shocking details…..
(Lanka e News – 26.Sep.2018, 10.45PM) Sri Lanka ‘s notoriously corrupt president Pallewatte Gamarala who never forgets to boast about his simplicity has made his tour of New York to attend the UN conference a junket full of fun and frolic for his entire brood and more he took along, which jumbo group includes not only his entire family but even families of the family, that is even families of the one who is going to marry into his family. Sadly however there is a most reprehensible side to his junket which makes it stink worse than his lankot , that is ,he is treating the official tour like a grand private wedding party of his with his entire family and more joining , while the state is meeting every cent of the expense. Mind you , Simple Simon Sirisena has taken 13 security officers officially to provide security for his families. Though security is provided by that country to a state leader when he goes alone , in this instance our president Gamarala had taken much more from SL than is warranted . 22 journalists have accompanied him , and of them 11 are from the president’s media ! Nimal Welgama who is not in the so called official list of the Divaina media has also gone to New York. This is for no other reason than to plot and plan the formation of a new government making Mahinda Rajapakse the Prime minister after chasing out Ranil , when Gamarala and his brood return. The group comprising 63 members who went on the official tour of New York are having their mirth and merriment in Loews Regency super luxury hotel in New York while his family and families of his family have booked another super luxury hotel for their enjoyment to the hilt. The name of that Hotel is the famous Marriot hotel . The worst part ? 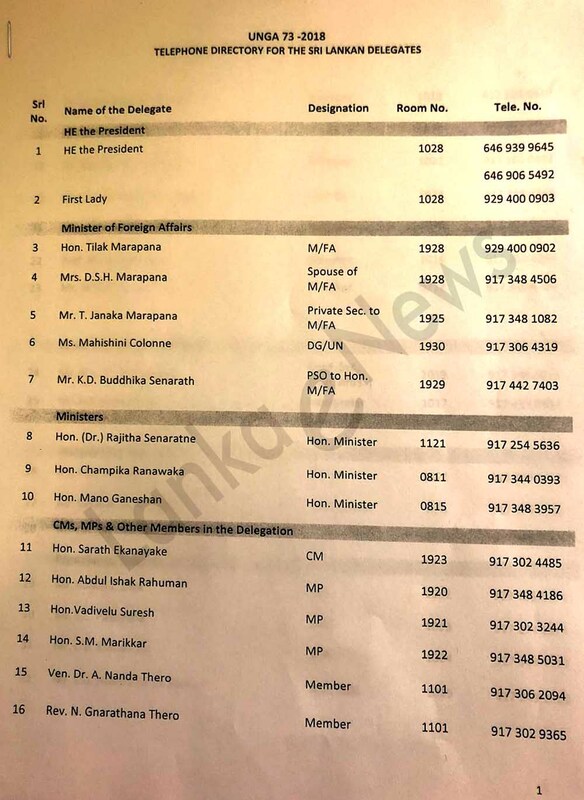 In this junket of president Gamarala ,officers of the foreign ministry have been assigned the duty to look after and maintain his unofficial family members : Two officers of the foreign ministry to look after and maintain 5 members including Chaturika and her family , and four more officers of the ministry to dance attendance on Daham and the family of his fiancée Nipuni Weeraratne. 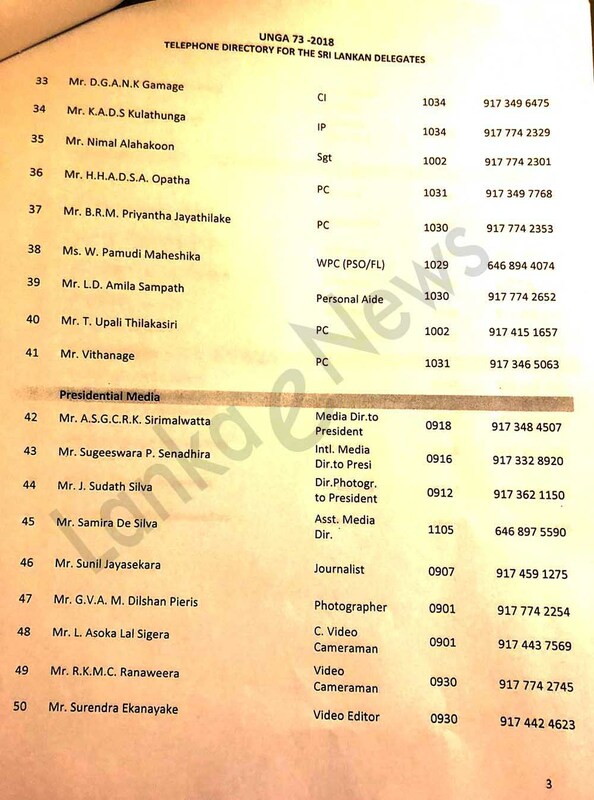 The official list of this jumbo group who are merry making at public expense is with Lanka e news and is published herein. In addition , another group too about the same size has unofficially gone to New York. That list shall be revealed later. What is most rudely shocking is, the entire expenditure of both the official and unofficial groups is met by the public funds. It is significant to note , this is the ‘simple’ president dubbed Simple Simon who as soon as he became president loudly and proudly spoke about his simplicity and austerity to the world , is now wasting public funds without any qualms and with gay abandon even surpassing the most profligate corrupt Rajapakses. 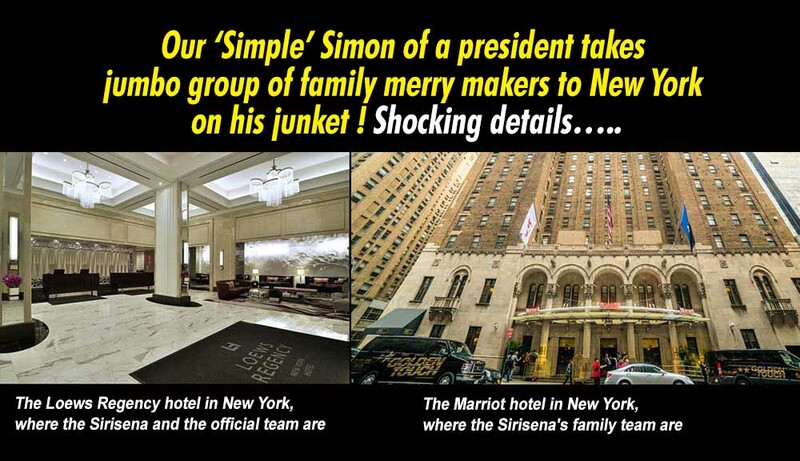 It is a pity it is this so called simple Sirisena alias Simple Simon who has chosen to make this junket a ‘grand wedding banquet’ abroad for his family and families of the family , at people’s expense. 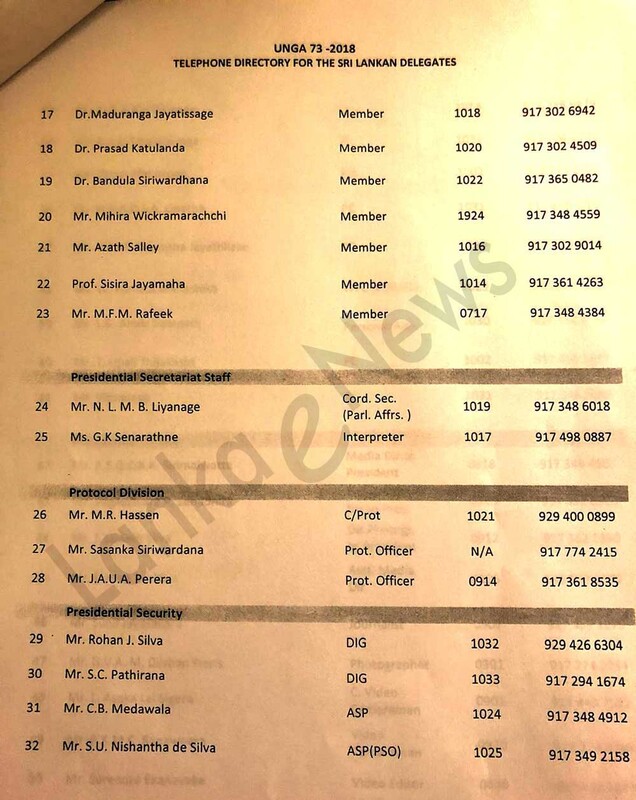 While publishing the list of those of the jumbo group of Sirisena’s merry makers ,and details of the hotel they are staying, their phone numbers and room numbers are also revealed herein . 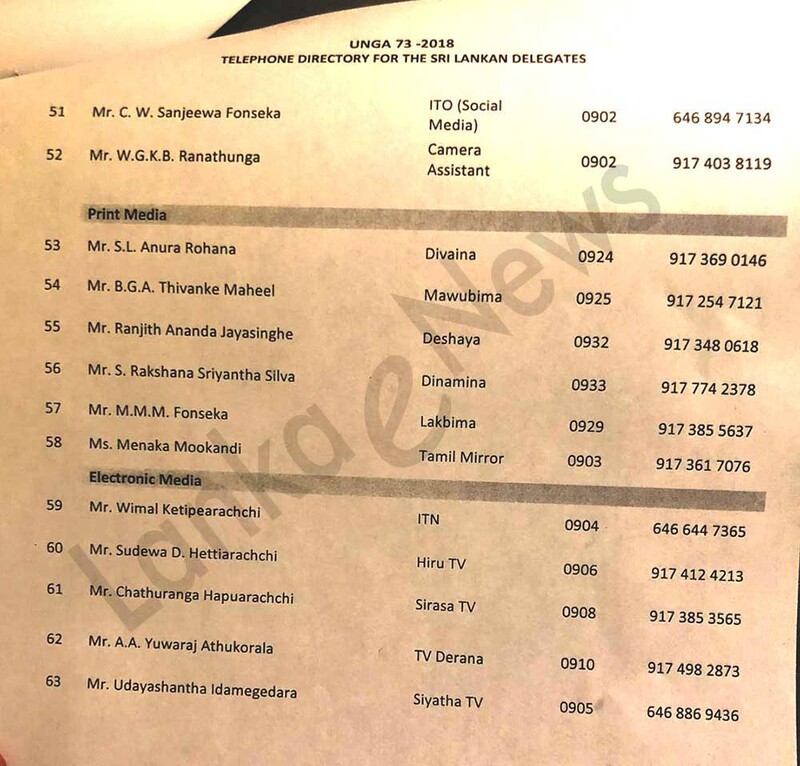 In addition Lanka e news has made arrangements to those who have need , to contact this jumbo group of merry makers whose entire expenditure burden is shouldered by the people.